You will need Node 8+, Expo and Yarn installed on your machine. In this tutorial, we’ll be building a Pokemon battle game with React Native and Pusher. In this part, we’ll be implementing the game’s practice mode. This is where we’ll be implementing the team selection and battle screen (login screen is already pre-coded in the starter project). First, the user logs in and selects six Pokemon that they want to use for the battle. Once the user has confirmed their team, an opponent Pokemon team will be randomly generated. The user gets to battle each Pokemon in the opponent team, but they won’t fight back. In part two, we’ll be implementing the two-player mode. This is where we will use Pusher channels, and a Node server to match users who are currently looking for an opponent. Additionally, we’ll also be showing messages to inform both users on the actual attack that was used and its effectiveness (for example, Pikachu used Thunderbolt! It’s super effective). In part three, we’ll be adding animations and sounds to make the game more interactive and fun to play with. Specifically, we’ll animate the health bar when a Pokemon is attacked, animate a couple of attacks (for example, Fire Punch or Ice Punch), and animate when the user switches to a new Pokemon or their current one faints. As for the sounds, we’ll add background music in each of the screens, and play the specific Pokemon cry as they get switched to or when they faint. Basic knowledge of React Native, React Navigation, Redux, and ES6 syntax is required. It’s always recommended to use the most recent versions available to you, but those versions are there as a reference in case there’s a major change with those packages which causes the code used in this series to not work. We’ll be using Expo in order to easily test the app on multiple devices. Install Expo on your computer, then download the Expo client app for your iOS or Android device. If you’re not familiar with how Pokemon battles are done, there are usually two Pokemon trainers, each has six Pokemon in hand. Each trainer will select one Pokemon to battle the other trainer’s Pokemon. The goal is to make the other Pokemon lose all of its health points (HP) by using different moves (for example, Thunderbolt or Hydro Pump). Once the Pokemon loses all of its HP, they cannot be used again. The trainer can also switch out their Pokemon. This is usually done to take advantage of type-effectiveness (for example, fire type Pokemon is effective on grass types, but is weak against water types). In the middle of the battle, the trainer can also bring back the lost HP of their Pokemon by using healing items (for example, potion). There are also items for healing status conditions (for example, sleep or paralysis). These status conditions are invoked by using specific moves like Sleep Powder or Thunder Wave. The first trainer who loses all of their Pokemon loses the game, while the trainer who still has Pokemon wins. Status conditions - no conditions such as frozen, burned, and poisoned. Item usage - no items such as full heal, max potion, berries. Once an opponent is found, it will show the battle screen. The first turn will go to the user who confirmed their team first. Once a move is chosen (either attack or switch), the user can no longer make another move until their opponent has made their move. Each user just takes their turns until such time that someone has defeated the whole team of their opponent. In this part, we won’t be implementing all the features yet. As mentioned in the introduction earlier, the first part will be the practice mode. This is where the user only gets to play the game by themselves. The app that we’re building is pretty huge, that’s why I created a starter project which contains the Pokemon data, UI components, helper functions, and the bare-bones version of each screen. This way, we don’t have to code everything from scratch and we can focus on the more important parts of the app. Before we proceed with writing some code, let’s first do a quick tour of the code we have on the starter branch. The src/data folder contains the pokemon (src/data/pokemon_data.js) and moves data (src/data/moves_data). Open those files so you have an idea of what the data structure looks like. The moves array in each of the Pokemon object in the src/data/pokemon_data.js file contains the ID’s of the moves in the src/data/moves_data.js file. The app will pick four random ID’s from the moves array and get its details from the src/data/moves_data.js file. The assets folder contains app assets such as images, fonts, and later on, the sound files. 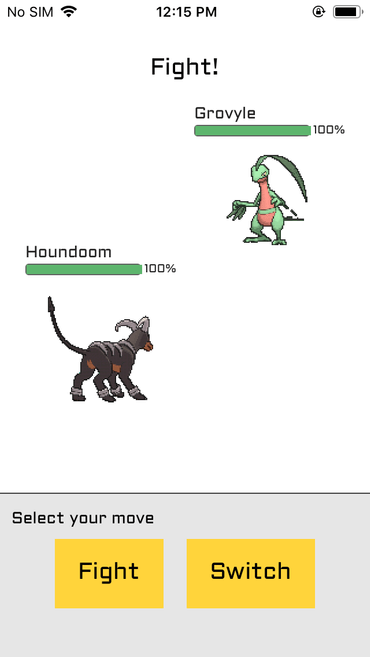 We’re using three different images for each Pokemon: sprite, front animated, and back animated. I got the sprites from pokemondb.net, while the front and back gifs are from pokestadium.com. For the custom font, we’re using Aldrich from Google Fonts. ActionList - for showing the actions that the user can do. In this case, there are only two: attack and switch. HealthBar - for showing the current health of each Pokemon. MovesList - for showing the list of Pokemon moves. PokemonFullSprite - for showing the back and front animated gifs of each Pokemon. 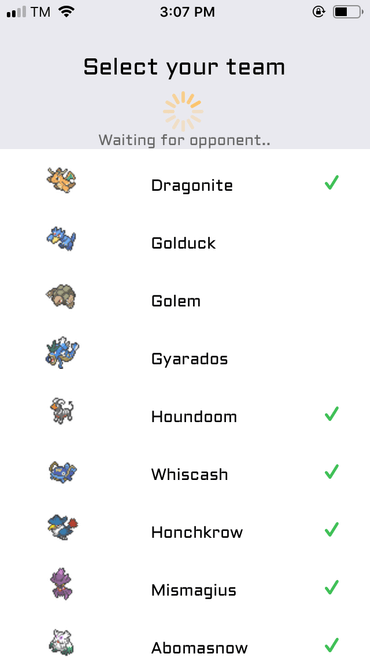 PokemonList - for showing a list of Pokemon for the team selection and battle screen. 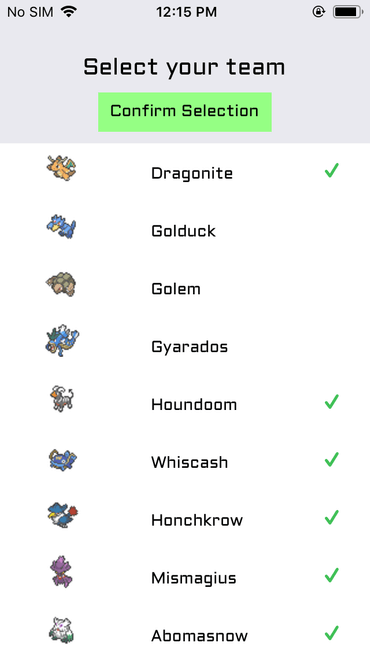 PokemonOption - for showing the individual clickable Pokemon in the PokemonList. CustomText - allows us to use the custom font. Note that the UI for these components are already written, but we still need to turn a few of them into “connected components” so they can dispatch actions and have access to the app’s global store. getMoveEffectivenessAndDamage.js - for calculating damage made to a Pokemon based on a specific attack and the attacked Pokemon’s type defenses. randomInt.js - for generating a random integer between a specific range. shuffleArray.js - for sorting arrays in random order. It’s used for sorting the moves data randomly so that random moves can be picked for each Pokemon. uniqid.js - for generating a unique ID for each member of your Pokemon team. The src/screens folder contains all the screens of the app. Only a placeholder content and the screen’s final styles are pre-written in the starter project. 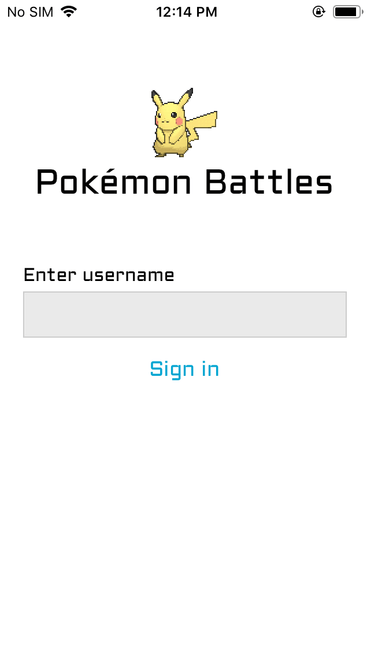 The Login screen is already completed because all it does is pass the username to the team selection screen as a navigation prop. Navigation code is also set up for all the screens, so all you have to do is navigate between the screens. Lastly, to make it easier to debug the app, the initialization code for Reactotron is also pre-written. All you have to do is update the value for the host with the internal IP address assigned by your router to your computer. This way, Reactotron can find your Expo app. You can find that code in the Root.js file. Now that you know which part of the app is already pre-written, we’re ready to implement the functionality for each screen. As you noticed in the code above, we’re only processing the SELECT_POKEMON action type. This is because SET_POKEMON and SET_TEAM will be processed in the reducer for the battle screen related actions which we’ll add it shortly. We only added them in the action types and action creators file because they’re needed in the team selection screen. We will update the above code in part two, so it actually tries to find a real opponent for the user. // previously added code here.. 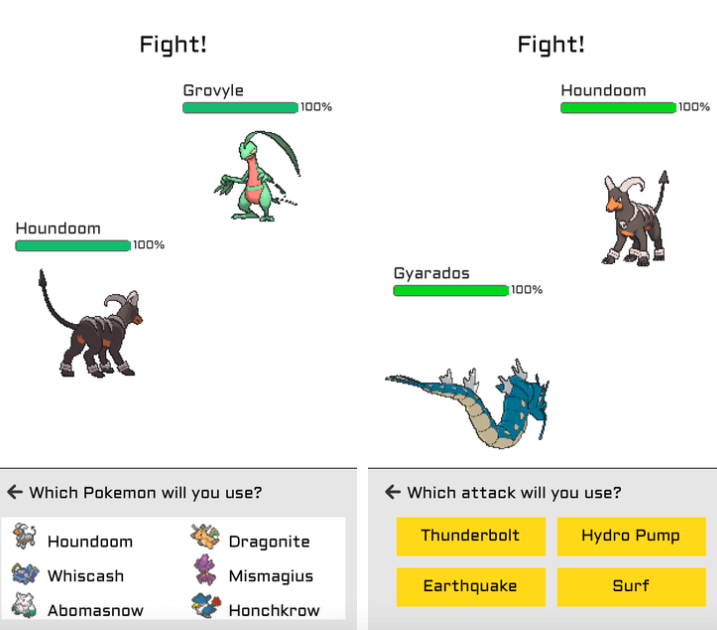 In this tutorial, we’ve created a Pokemon battle game app using React Native and Redux. Along the way, you’ve strengthened your basic Redux knowledge by building an app that makes use of all the basic Redux concepts. Stay tuned for the second part where we will implement the two-player mode, so the users actually get to battle another human. You can find the full source code of the app on this GitHub repo. The code added to this specific part of the series is on the practice branch.